If you're not a regular reader of Battlegrip.com you need to be. Philip Reed has a real passion for latching on to (possibly obsessing over) great toy lines and unique concepts from the past and writing all about them. Over the past few months Philip has been frequently posting about Kenner's 1998 Star Wars: The Power of the Force II sub-line based on the Expanded Universe books, looking at not just the figures themselves but also the interviews, magazine articles, and marketing surrounding them. I have vivid memories of receiving most of these figures for Christmas of 1998 and they've always been some of my favorite Star Wars toys ever since their release (tell me that's not the coolest Luke Skywalker look ever). 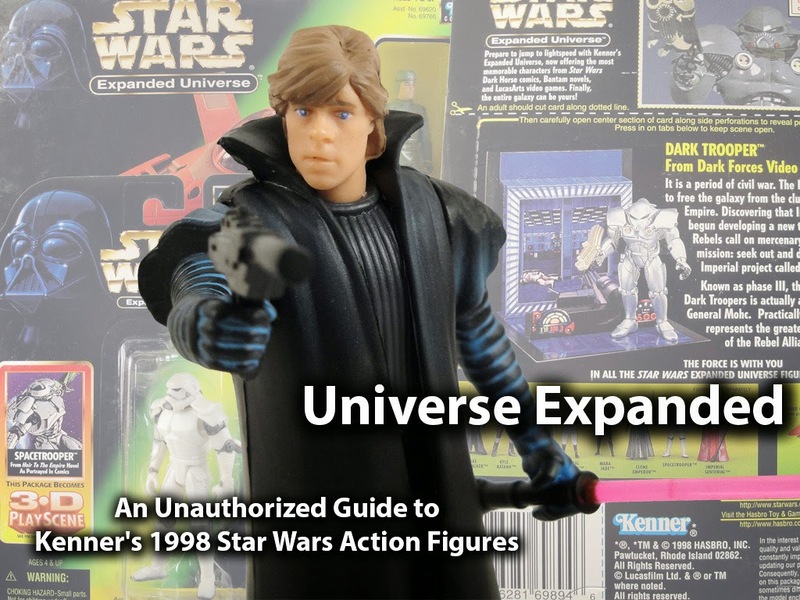 To celebrate this great line, Philip is putting together a hardcover book through Kickstarter: Universe Expanded: An Unautorized Guide to Kenner's 1998 Star Wars Action Figures. If you've never checked out one of Philip's books such as Each Sold Separately, Action Figures Not Included, or Transforming Expectations, you should know that these are well written, professionaly printed books filled with excellent reference photos of not just toys but also marketing materials and images from various periodicals. If you're a fan of Star Wars or action figures from the mid-late 1990s, you definitely need to check out this book. If you're interested in joining in to get this book published, head on over to Kickstarter and pitch in a bit to get yourself a copy.